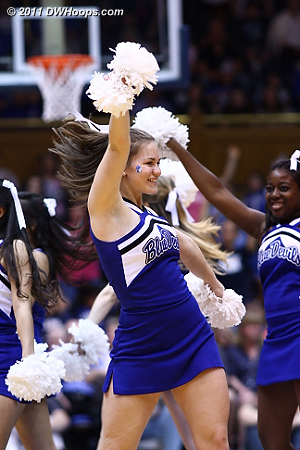 Over 100 Member photos are posted, including extra-large photos on click-through. 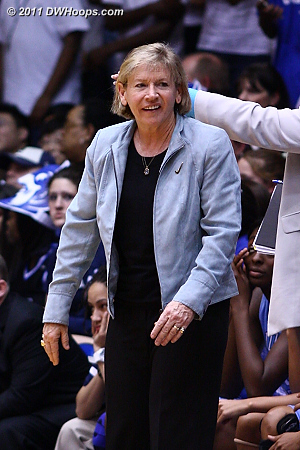 All public photos have also been posted. 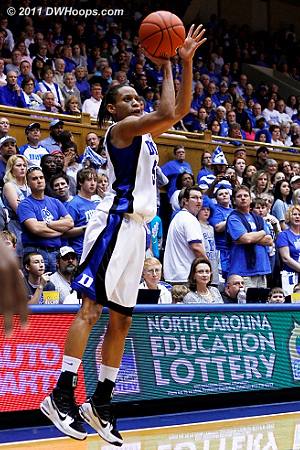 Galleries of Senior Day activities and net-cutting for the ACC Regular Season Title have been published separately. 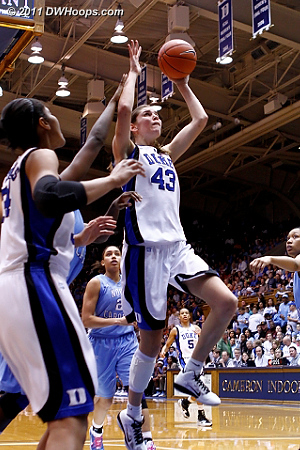 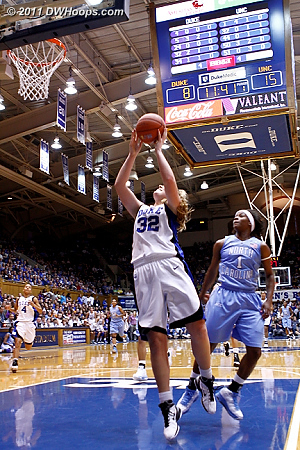 Tricia Liston started the game and scored Duke's first bucket. 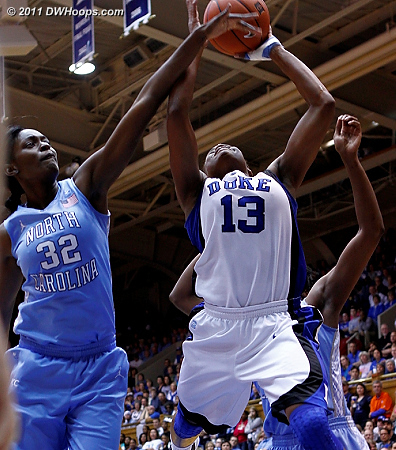 Karima Christmas goes flying after being fouled by Chay Shegog. 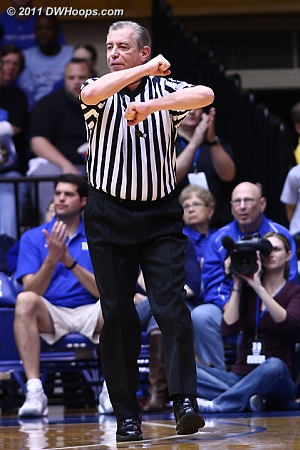 Shegog was whistled for two fouls before the first TV timeout. 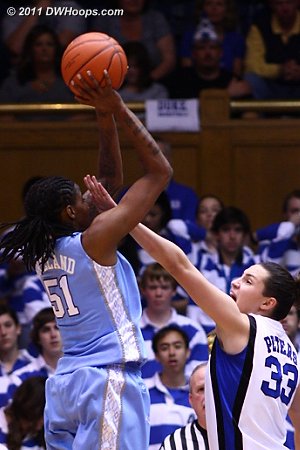 Waltiea Rolle and Jessica Breland (obscured) blocked Jasmine Thomas' jump shot. 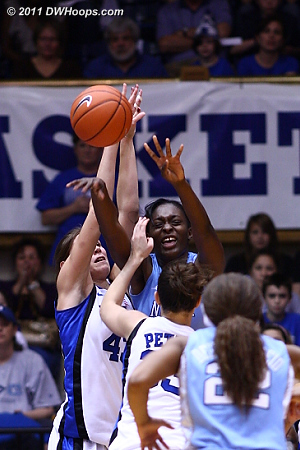 Caught in a mismatch, Rolle calls for help as Karima Christmas drives. 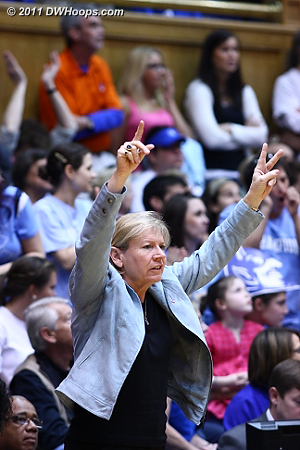 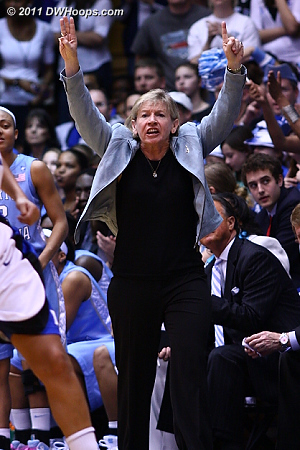 Coach Hatchell on the UNC bench, trying to snap a three game losing streak. 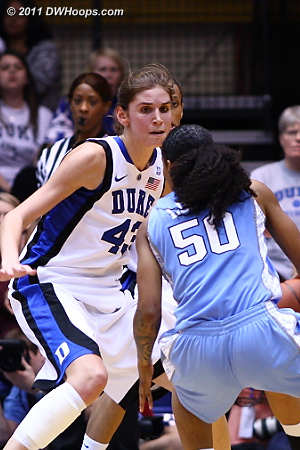 Italee Lucas looked good but the result wasn't even close. 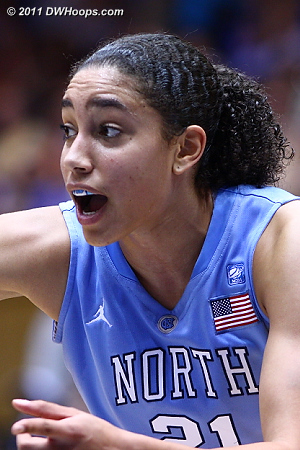 Still UNC led by seven, 15-8. 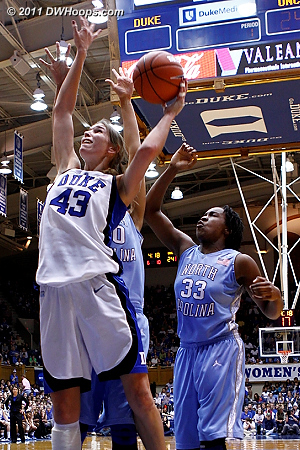 Tricia Liston started the big Duke run by scoring in transition. 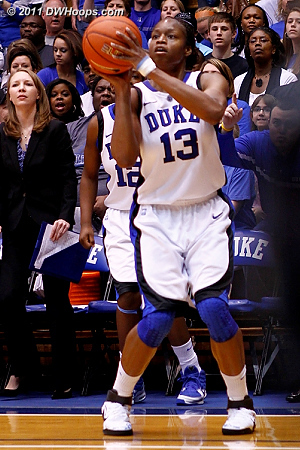 Lucas had plenty of open looks from long range, but finished 3-11 from that distance including this miss. 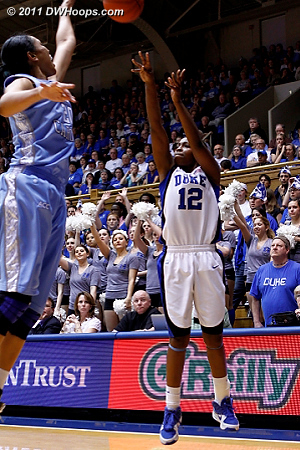 Karima hit from the corner, cutting the Heels lead to two. 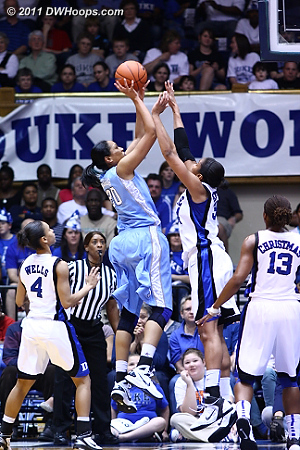 Karima pulls up in transition to score, it's 17-15 UNC. 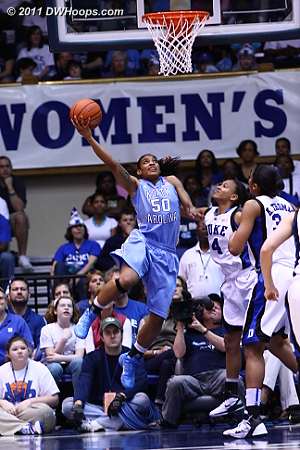 Jasmine Thomas tied the game at 17, and one! 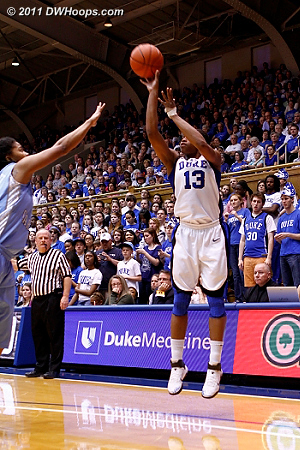 At the 8:17 mark Duke was already in the bonus, and two Christmas free throws gave the Devils a 20-17 lead. 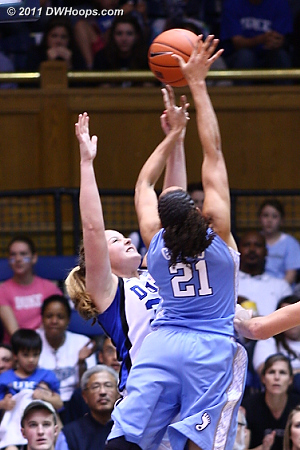 Shay Selby was left all alone to knock down a trey, Duke leads 26-19 and the Heels call a time out. 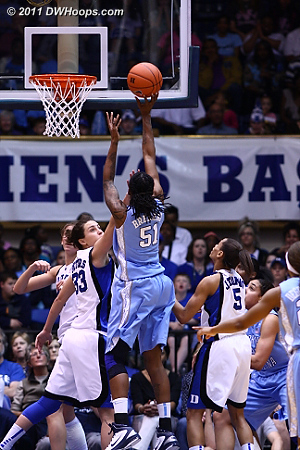 Lucas answered for UNC, hitting a trey. 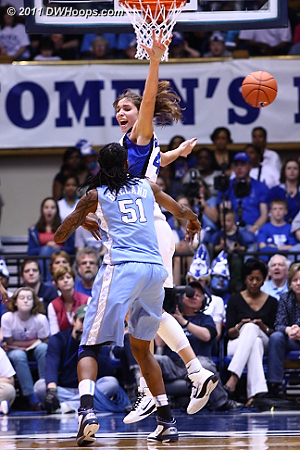 Kathleen Scheer puts it on the floor against Cetera Degraffenreid - a tough night for Scheer. 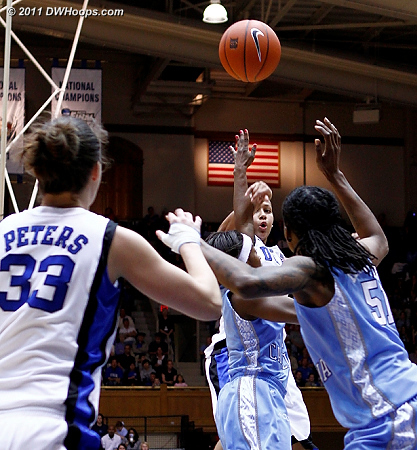 The Heels put Chloe Wells on the line with four seconds left in the half - Duke trailed 31-29 at the break. 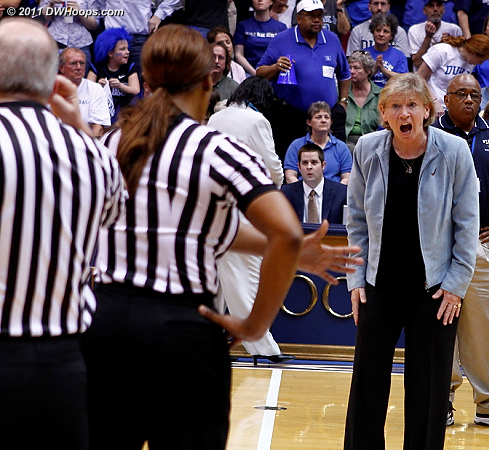 Sylvia Hatchell berates Carla Fountain for not calling a technical foul for delay of game against Duke. 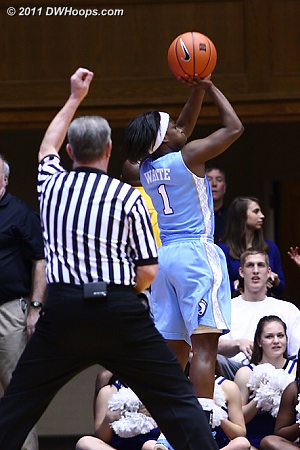 Krystal Thomas did catch the ball after the Wells free throw, but no warning was issued. 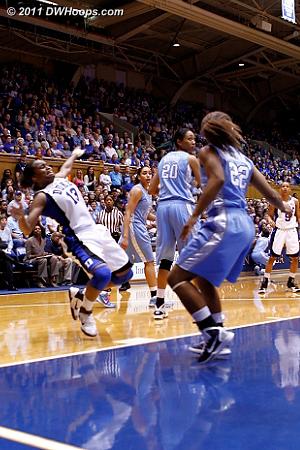 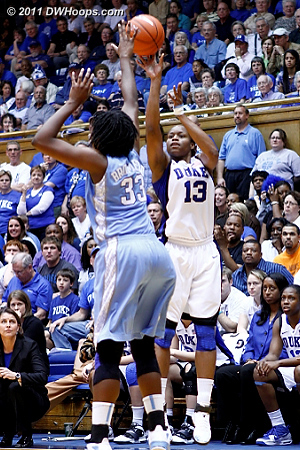 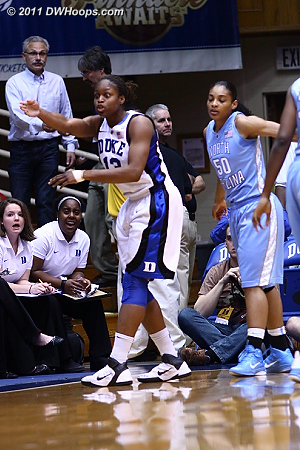 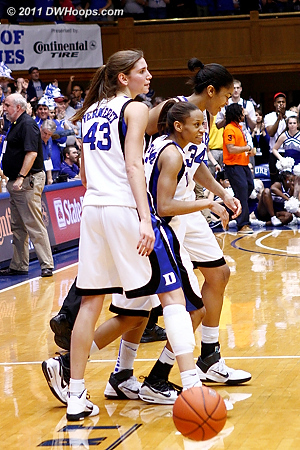 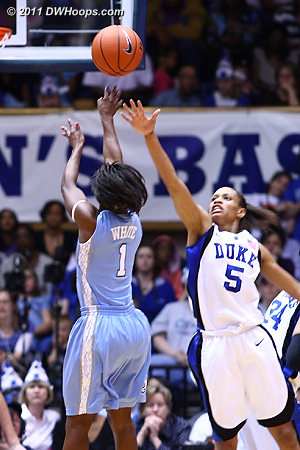 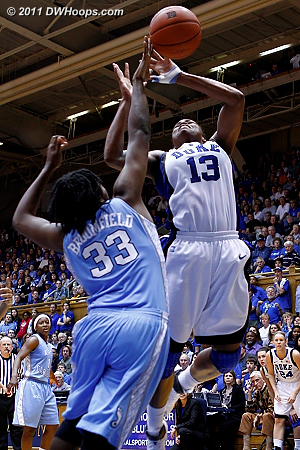 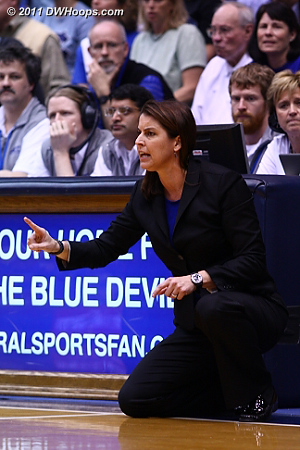 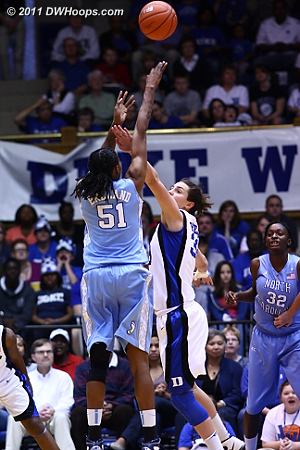 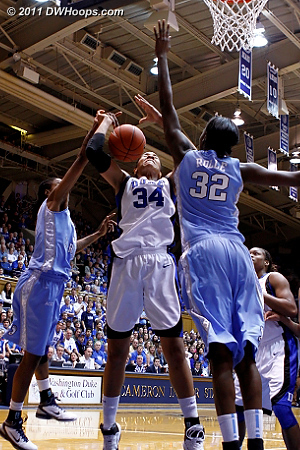 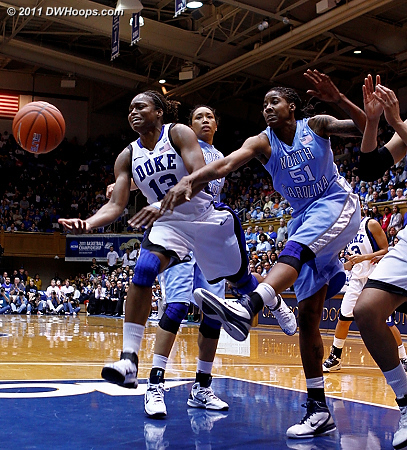 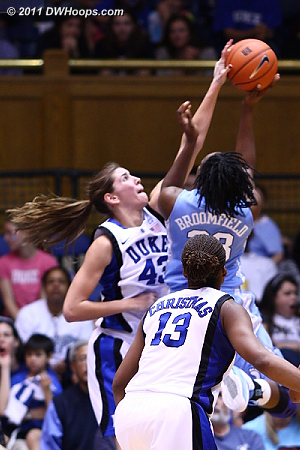 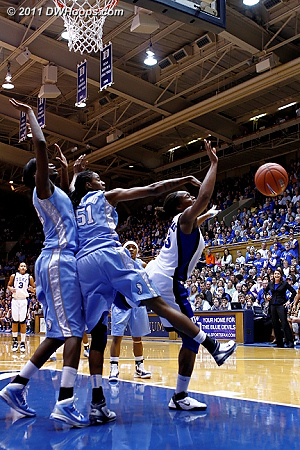 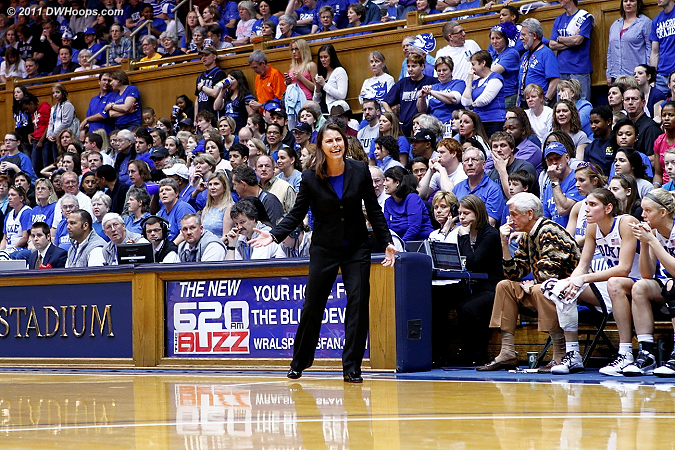 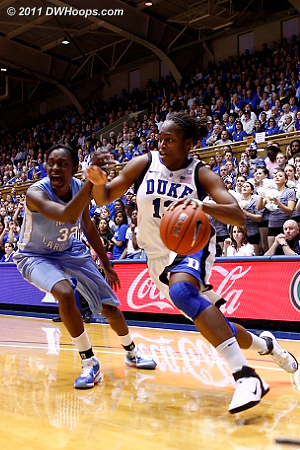 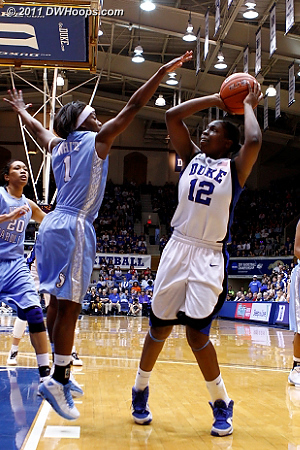 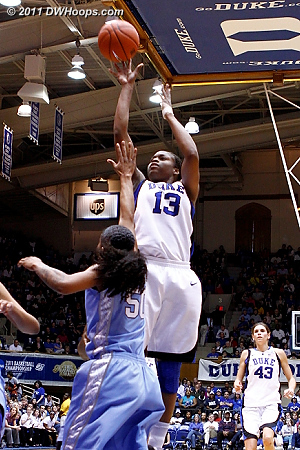 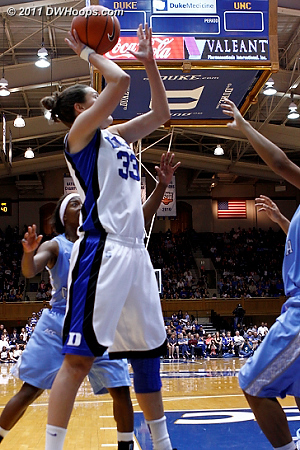 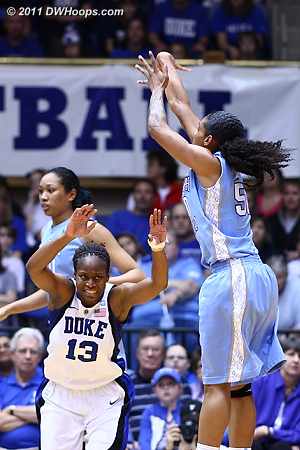 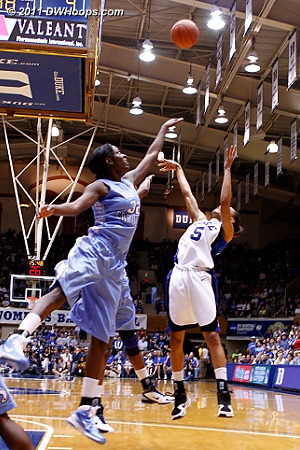 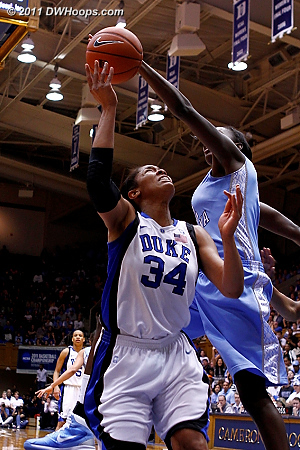 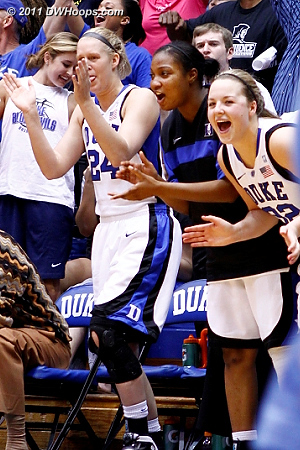 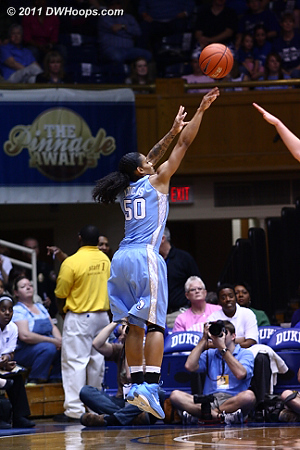 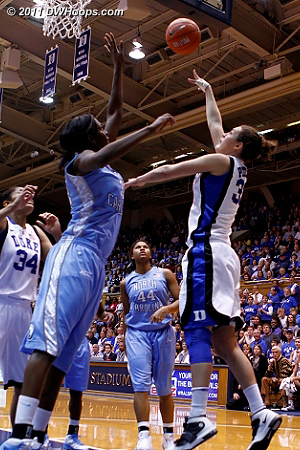 Karima hit from in front of the Duke bench, 38-37 Devils and the Heels would never lead again. 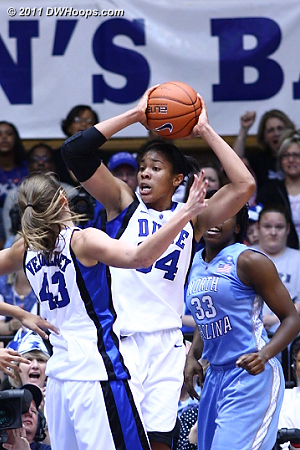 Jasmine Thomas scored a game high 17 points to lead Duke to victory - here she hits a corner trey for a 56-42 Blue Devil lead. 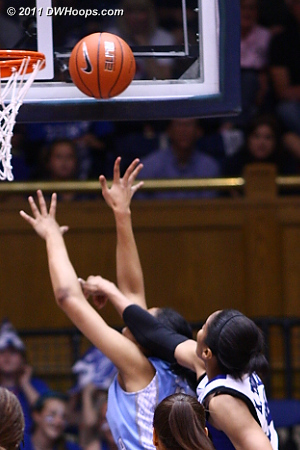 She'La White hits from the corner to cut it to 8, 60-52 Devils. 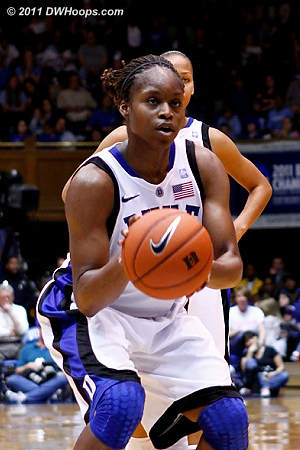 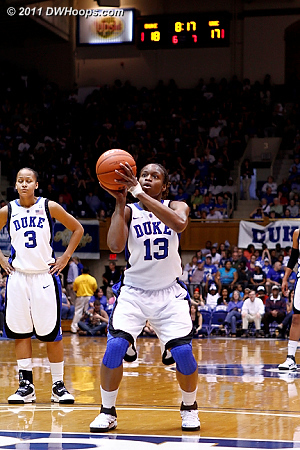 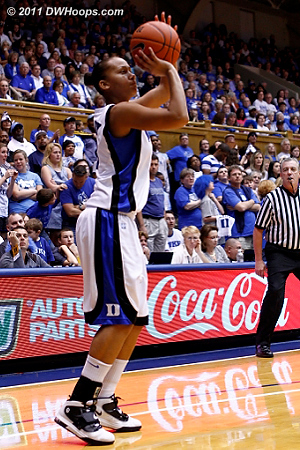 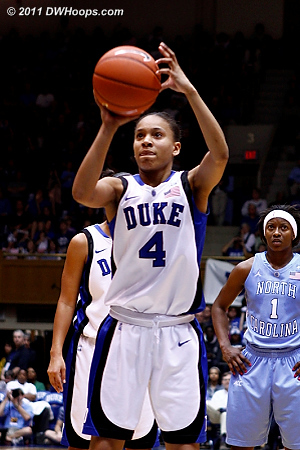 Karima made the second free throw for a seven point Duke cushion. 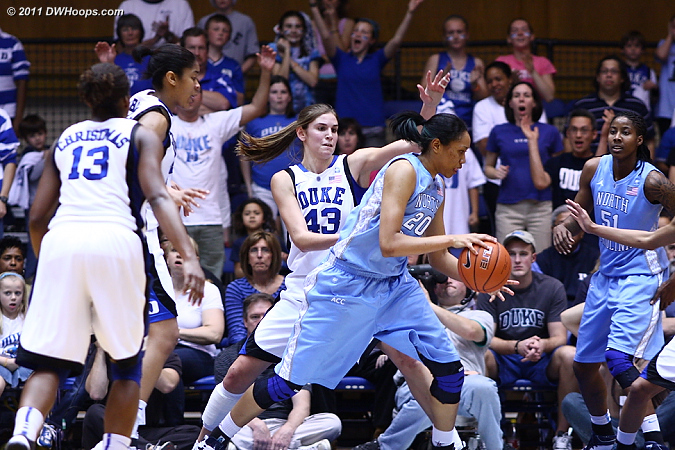 Tough defense from Duke forced the Heels to run valuable time off the clock. 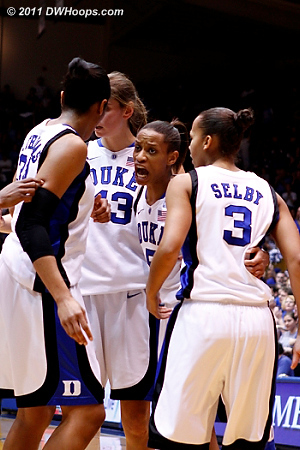 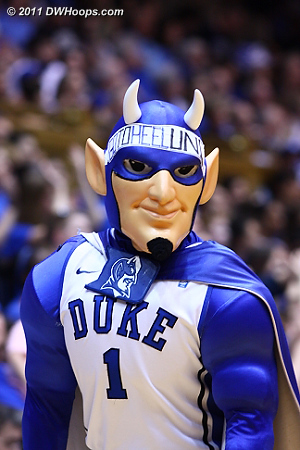 It's over, Duke wins a share of the ACC Regular Season Title, the #1 ACC seed, and are victors on Senior Night. 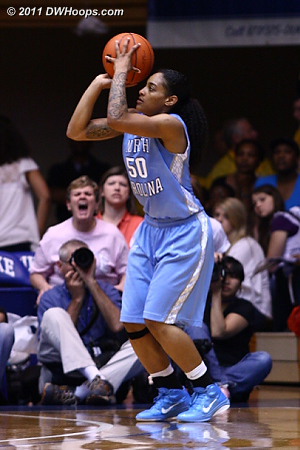 Photos from Senior Night and net cutting will be posted here separately.